If I didn't know any better, I would think my friend Mark tooled around LA in his car all day, stalking celebrities. But, alas, he doesn't... he just lives in a swank little part of town overrun with them, which is why he runs into them wherever he goes. Do you know who it is? Can you tell? Can you, can you? It's Lauren Graham from Gilmore Girls! 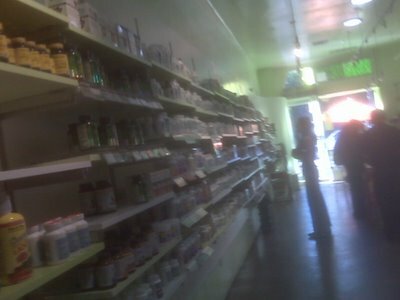 She was at a health food store buying something or other. You know, I never watched much Gilmore Girls, but heard it was good. Is it still on? Did (does) anyone watch?